With spring or autumn approaching, you want to extend the use of your pool. You need to find methods to heat these large volumes of water in an environmentally friendly way. Everyone loves the extended fun. Ready for your solar pool life? Electric heater – You end up paying high energy bill every month. gas, usually a propane heater– Even worst and costly than electric. using a pool cover – Can not control temperature but it is an easiest and cheaper way. solar heater -Best solution and Green! 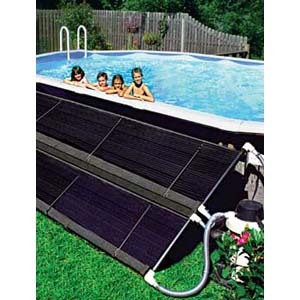 You need a solar pool heater to ensure your home swimming pool remains your great family playground all year round. Building one yourself is easier and a lot cheaper than you think. This building guide provides detail instructions of easy step by step and takes you through the simple building process of your own Solar Heater. AquaQuick SolarPRO XD3 – Heat your pool water the GREEN way by using solar energy.